We provide support services to the telecommunications industry. With more than thirteen years’ experience, we deliver high quality, cost-effective support services and innovative products to leading telecommunications companies in Nigeria. We provide a full range of services and material support to allow our clients full telecoms infrastructure deployment as well as post deployment maintenance and energy solutions and management. 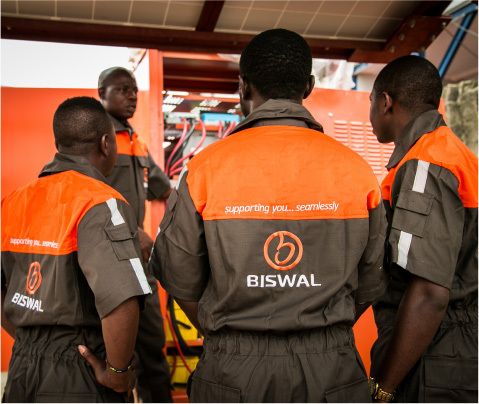 Biswal supports telecommunications industry leaders, both within and outside Nigeria. We acquire, develop and deploy resources in order to deliver the best possible quality in service for the telecommunications industry. We support the business of Africa’s largest and most innovative mobile telecommunications providers. Unique in the market, we are able to anticipate our customers’ needs and meet them. We provide outstanding support to our customers with extraordinary service from start to finish – and this puts us in an unrivaled position in the Nigerian marketplace. Our vision is to provide the best support in the global telecommunications industry. We aim to provide world-class, cutting edge support on a personal level. We are committed to becoming the leading infrastructure service provider, with unparalleled support services. We are a customer-focused company, priding ourselves in our unrivaled commitment to our clients. We are dedicated to providing an outstanding, seamless service no matter the challenges involved. We achieve this by working together as a strong team, investing in our employees to ensure a professional, supportive culture for everyone. ASSETS: our assets are first and foremost our people, followed by our capital and our reputation. QUALITY: we take pride in the outstanding quality of our work. SIZE: we are big enough to support our clients of larger proportions, but still small enough to provide a personal service to all clients. OPPORTUNITY: because of our size, we are able to offer our employees more opportunities faster than possible in larger companies. CREATIVITY: we pride ourselves on coming up with creative and original solutions, always striving to find a better way to achieve our goals. Just off Industrial Avenue opposite Total Filling Station.